Richard Stansfield, director of business development at Auto Electrical Services, admits that he used to have a laissez-faire attitude to the company’s fleet of seven vans and four company cars. His attitude changed thanks to Van Excellence, the national accreditation scheme for van operators, which is run by the Freight Transport Association (FTA). Auto Electrical Services achieved Van Excellence last year – the smallest fleet operator to do so – and has just passed its second audit. It also recently achieved ‘Bronze’ level of the Fleet Operator Recognition Scheme (FORS), which aims to improve fleet activity in London. Auto Electrical Services is a long-established family business – it was set up in 1952 by Stansfield’s grandfather – and has service contracts with the Metropolitan Police, the London Fire Brigade, the London Ambulance Service and a number of local councils for their vehicles’ air conditioning and heating. It also sells and fits TomTom telematics, as well as add-on fleet management software, FleetCheck. 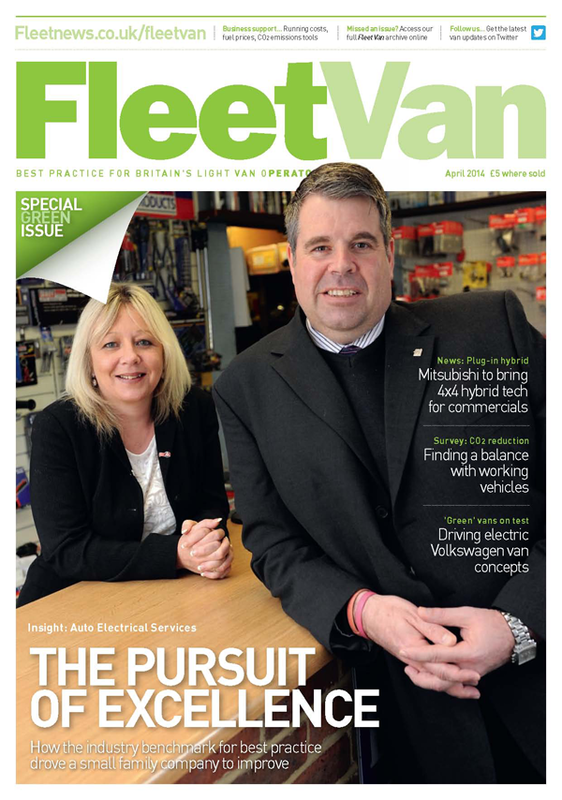 Stansfield put Auto Electrical Services forward for Van Excellence at a meeting with the FTA. “It was with a bit of trepidation because we had to change a business with 1950s values into one with a modern-day ethos of health and safety and compliance,” he says. He says a lot of the credit for achieving Van Excellence has to go to Auto Electrical Services projects manager Nicky Francis. She has taken on fleet responsibility alongside Stansfield. “Big fleets have fleet directors with fleet managers and depot managers,” Stansfield says. However, he believes SMEs shouldn’t be afraid to undertake Van Excellence. “If you follow the pre-audit checklist and work your way through it step by step, it’s not painful,” he says. One of the first steps Francis took was learning how to check driving licences properly. She also created a driver’s manual and made sure every van had a medical kit, high visibility jacket, warning triangle, break-glass hammer, torch and accident log book. Getting drivers on board with daily vehicle checks “Before, it was hit and miss whether the drivers had those things,” she says. Drivers also undergo an annual medical check. Auto Electrical Services has moved from a paper-based system to an electronic one. It now uses FleetCheck to keep track of when vehicles are due for a service or MOT. “You name it, it’s on there,” Francis says. Stansfield adds: “There are things that can get missed as an SME unless you’re being told by a fleet management system you need to have an MOT done on this day.” The vehicle check sheets are scanned into FleetCheck, but Stansfield intends to introduce the All on Mobile app, which will pre-populate information for drivers, allow them to take photos of any damage, add any comments about work required, sign it off and submit it. The office will then receive an email to say the vehicle check has been carried out. Auto Electrical Services has also started using a broker, Fleet Find, to source the best deals for vehicles rather than purchasing them outright or having leasing agreements direct with Renault Finance or other leasing providers. “Fleet Find took our old vans and part-exchanged them for the new ones which lowered the costs,” says Stansfield. All new vans are speed-limited to 68mph – a requirement of Van Excellence. getting ready for the first Van Excellence audit took about six months, according to Stansfield. In the lead-up to the audit, the FTA was always available by telephone to answer any queries and advise on any procedures that needed tightening up. The audit itself took about two hours and required Francis and Stansfield to not only say what processes they had in place, but to demonstrate them too. For example, they had to produce records of driving licences. Auto Electrical Services now sits on the Van Excellence governance group, which is made up of major van fleet operators that meet to discuss and agree any changes to Van Excellence. “It’s quite interesting for us to sit there and listen to the big fleet problems and realise they have the same problems as us, but they’ve got a lot more risk, they’ve got a lot more to do,” Stansfield says. Auto Electrical Services also now promotes Van Excellence to its customers.